This month, Neil Liffen, director of East Coast Physio Ltd (ECP) discusses plantar fasciitis (PF), which is one of the most common conditions affecting the foot. Plantar fasciitis may be confused with ‘policeman’s heel’ but they are different. Policeman’s heel is called plantar calcaneal bursitis – inflammation of the sack of fluid (bursa) under the heel bone (calcaneus) and this is not as common as PF. The plantar fascia is a strong fibrous band on the sole of the foot, which helps support the arch. It arises from the heel bone and inserts into the toes (Figure 1). The heel bone is protected by a specialized pad of fat that cushions it when we stand and helps protects the attachment of the plantar fascia. Commonly, symptoms include sharp or stabbing sensation in the region of the heel, typically when weight bearing from sleeping or from getting up from a chair after a period of rest (start-up pain). Start-up pain often resolves but may be replaced by a dull constant aching or throbbing pain on prolonged weight bearing or walking, and at the end of the day or during the night. There is no definitive underlying reason for PF, but risk factors include weakness and tightness of your calf muscles, prolonged standing or weight bearing, being overweight or sudden weight gain. 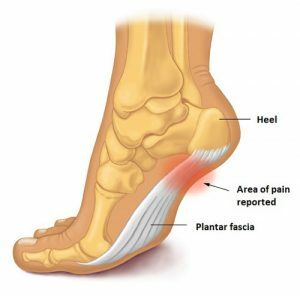 There are several theories as to the cause of PF, but the most likely is that mechanical overload and excessive strain results in micro-tears in the tissue of the heel that in turn give rise to thickening of the fascia. Repeated overload may hinder or prevent normal healing and may result in chronic inflammation and degeneration of the tissues and causes pain when the heel is compressed. In the majority of cases your clinician will be able make the diagnosis from the symptoms and examination findings alone. Occasionally, it is necessary to perform investigations, such as X-rays, Ultrasound and MRI, to confirm the diagnosis or exclude other causes of heel pain. Bony spurs were once recognised as contributing to PF, but are a common finding in persons without PF, and research supports this. One of the advantages of appointments with Neil Liffen, is the use of Ultrasound on the day of your appointment, if clinically indicated. Ultrasound may be utilized to assess for plantar calcaneal bursitis, plantar fascia tears/ruptures or rule in or out other pathology. There are a number of conservative treatment options, which may be effective in the treatment of PF. At ECP, we also offer extracorporeal shockwave therapy for PF, which has a significant growing evidence base for its effectiveness. In recalcitrant PF cases, Neil Liffen can offer ultrasound guided injections. If conservative management fails, surgical options may be option. Fortunately, PF is a self-limiting condition and in most patients (80-90%) the symptoms will get better within 10-12 months. Neil Liffen, currently combines his working week as an Extended Scope Physiotherapist and as a Musculoskeletal Diagnostic Sonographer. He combines working at East Coast Physio, with performing diagnostic ultrasound for several radiology departments based in NHS hospitals. Therefore, he has vast experience in performing ultrasound on plantar fascia and treatment, including injections. Figure 2. 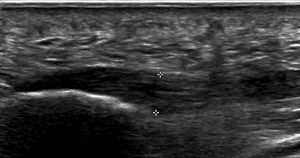 A thickened plantar fascia as demonstrated on ultrasound.